This is a hefty, chunky watch that's beautiful, stylish, and solar powered. Wait, solar? Yes, this watch is solar powered and never needs a battery. The black dial and silver colored band contrast in an elegant way. Instead of numbers on the dial, it has markers where the numbers should be. It shows the day and date, and has luminous hands and markers to easily tell time in the dark. 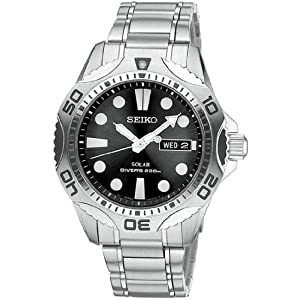 This watch is water resistant at 200m (660 feet!) so it's safe to wear while swimming. It's hard not to like this watch.